Remember when black and white glitters were all the rage? I remember when you could only find these types of glitters from indies. In early 2014, Maybelline decided to do their take on the black and white glitter, but adding colored matte glitter with black instead. This was one of my favorites from that collection and I loved seeing a drugstore brand take on the trend. 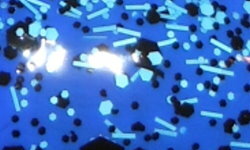 Blue Beats is a mix of varying types of a black and light blue glitter in a clear base. Color: I love the use of the blue matte glitter paired with the black. I love this color combination and how it does offer something unique rather than just black and white glitter. I like how these colors really stand out against my base color. Formula: Excellent and very easy to use glitter formula. There was no fishing or dabbing glitters here. I used 2 coats over a base. Price: This was a limited edition collection, but you can still find it online if you search in the $3-$5 range. Overall: I love this fun glitter and it reminds me I need to use glitter toppers more. I usually at bar glitter, but it works in this polish because it is mixed with other glitter shapes. It looks like confetti. I love the color and how it makes a statement on my nails.